The story is about Mikey, a little boy who likes to leave his things exactly where he wants them–in the middle of the floor. His parents aren’t too pleased. But then Mikey’s daddy leaves out something he shouldn’t–a book of matches. Both of them learn there are some things that shouldn’t be left lying around. In addition to the lesson that matches and lighters are adult tools only, the story is a gentle reminder that picking up clutter and keeping pathways clear is a good safety technique too. Read the book on your Mac or PC. 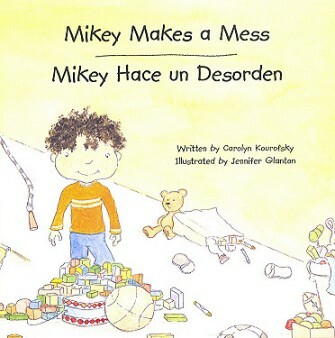 Mikey Makes a Mess provides important education, both for young children and their parents, in a fun, engaging story book in both English and Spanish. Mikey is a little boy who likes to leave his things exactly where he wants them—which means, in the middle of the floor. His parents aren’t too pleased. But then Mikey’s daddy leaves out something he shouldn’t – a packet of matches. Both of them learn there are some things that shouldn’t be left lying around. In addition to the lesson that matches and lighters are adult tools only, the story is a gentle reminder that picking up clutter and keeping pathways clear is a good safety technique for all emergency preparedness. Illustrations reinforce the message that every home should have smoke alarms. Includes questions for kids, and extra safety information for parents.